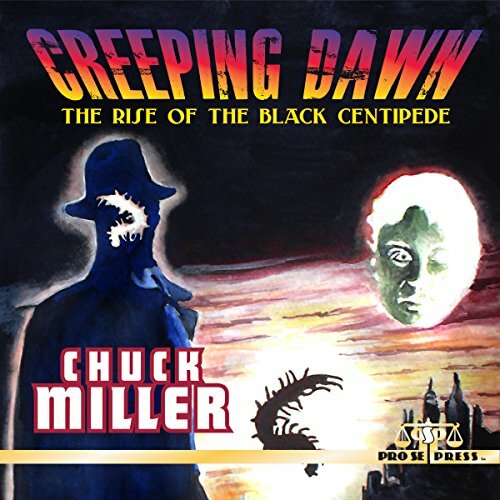 Author Chuck Miller took the New Pulp Movement by storm with his creation, The Black Centipede. And now, the volume that practically started its own sub genre- Psychedelic Pulp- is available as a top quality audiobook from Radio Archives- CREEPING DAWN: THE RISE OF THE BLACK CENTIPEDE! The first volume in an epic tale of heroes, villains, murder, and madness. CREEPING DAWN: THE RISE OF THE BLACK CENTIPEDE is a story that has to be experienced to be explained. Woven throughout a slightly familiar, but altogether disturbing history, this mysterious figure ascends to the level of hero, while sometimes threatening to fall to the depths of the Devil. Follow the birth and growth of one of the most original characters in New Pulp fiction to date, The Black Centipede, as created by Chuck Miller! This pulse pounding audiobook is also available on Audible and Itunes. CREEPING DAWN: THE RISE OF THE BLACK CENTIPEDE is available in print and digital formats at Amazon and www.prose-press.com. THE ULTIMATE REESE UNLIMITED CROSSOVER NOVEL – BARRY REESE’S ‘GOTTERADAMMERUNG’ DEBUTS!